Until 5:00am this morning, the fastest, single-processor, production machine ever tested by world-authority SPEC was a hugely expensive, 8-core SUN UltraSPARC system which managed a score of 85.5 in the peak integer rate test. YOYOTech has now blown that away with a score of 130 on a machine costing half as much... the Fi7EPOWER MLK1610. Built around an overclocked Intel Core i7 965 processor, the Fi7EPOWER MLK1610 runs with 9GB of high-performance Corsair DDR3 memory on an Asus P6T mainboard. That memory configuration gives 18BG/second throughput, literally blasting past all other data transfer architectures. Remember that with SMT (Symmetric Multi Threading) enabled, the Intel Core i7 965 presents 8 ‘cores’ to Windows Vista 64. Data transfer to and from other devices is also very fast – somewhere around 25.6GB/sec, using Intel’s QPI (Quick Path Interconnect) technology. The YOYOTech Fi7EPOWER MLK1610 makes best use of the available bandwidth by booting from an 80GB Intel X25 Solid State Drive. Storage is extended clear past 1 TeraByte with the inclusion of a Samsung F1 data drive. Pure graphics processing power is provided by the 2GB HIS 4870x2 card with back-up and input being taken care of by the LG Blu-ray MultiBurner. Clocked on air to a stable 3.73Ghz, the smoothest of power streams comes from the Cooler Master Silent Pro 700 PSU and the Cooler Master HAF 932 chassis ensures perfect air-flow around the world’s fastest PC. Combining stunning looks, technology and performance, YOYOTech’s Fi7EPOWER MLK1610 is now the standard by which all other PCs and workstations will be judged according to the Standard Performance Evaluation Corporation’s highly respected scoring system. 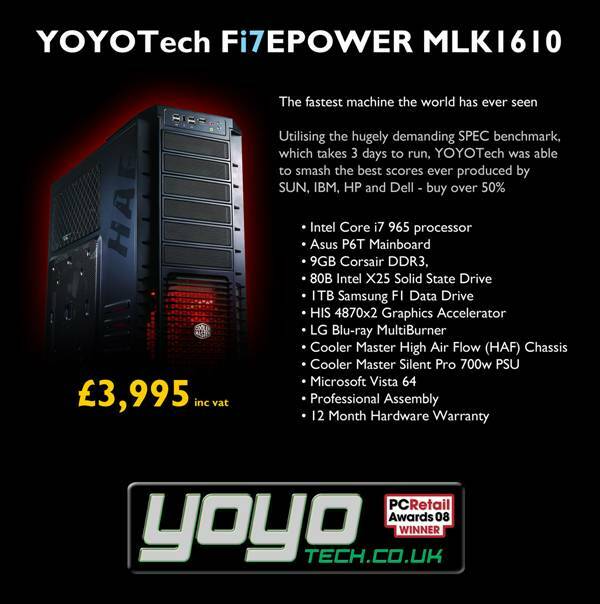 YOYOTech’s owner, CK, explained the pride his organisation feels with the launch of the Fi7EPOWER MLK1610 system, “During our early discussions, we said that we need to forget about budget. That we can’t think that anything was ‘too good’ for this PC. We went back to the mindset you have as a child. Focusing 100% on the ‘I Want, I Want, I Want’ mentality. I told my guys to focus on 100% pure performance and the pride that goes with knowing that customers will ‘own a piece of history’”, said CK. 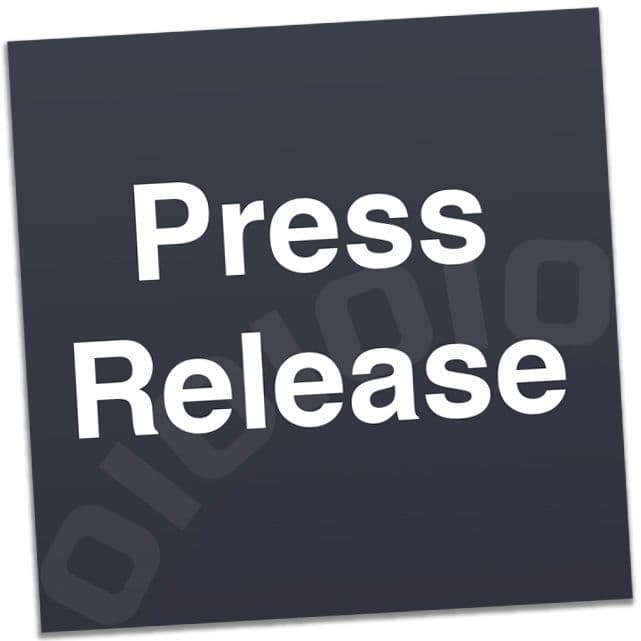 “We are offering the best and most intelligent processing system ever”. CK was clear about why his team had chosen SPEC for testing, “We’re not interested in liquid nitrogen systems that give fantastic numbers and then burn out after 20 minutes. SPEC can take more than 3 days to complete. With the Fi7EPOWER MLK1610 our focus was on creating the PC equivalent of a ‘Le Mans 72 Hour Winner’ – delivering the highest score ever seen for a single chip system”. CK was equally clear about which vendors have been targeted with this system, “We analysed the performance of the best single-chip products ever built by the likes of Sun, Dell, HP, Fujitsu and IBM - and then worked hard to literally blown their scores away using simple air cooling. In addition to the fastest ‘core processing’ scores ever seen, our system also offers an additional 2.4 TeraFLOPS of pure graphics processing power. That we were able to do this for less than £4,000 inclusive is something of a miracle and a testament to Intel’s new Core i7 technology”. Speaking about the target market for such a system, CK believes that it will have wide appeal, “For professional studios, processing ultra high-definition images and video, the Fi7EPOWER MLK1610 can drastically reduce processing times, which helps increase profitability. Designers and other artists will be liberated as their ability to ‘manipulate the world’ speeds up immensely”. “You have to remember that this system provides the best of both worlds, world-beating CPU power alongside 2.4 TeraFLOPS of graphics processing capability”, said CK. “So the system is equally at home in the design, testing and engagement phases of any project. For example, you could design, test and play games on this box in a way that has never before been possible and processing video using CS4 will be a dream”. Register your inquiry about the YOYOTech Fi7EPOWER MLK1610 from Monday 3rd November and units will begin shipping when Intel’s final embargo lifts toward the end of the month.